The plot: This mega-storyline followed a superpowered infestation of New York City that saw the many citizens of the Big Apple gain Spider-Man's powers - without any of his ethics. The infection leads to the entire island of Manhattan getting locked down, with the Webhead teaming up with his buddies in the Avengers and Fantastic Four to save millions of people from transforming into giant spiders. It's a fun, action-packed narrative that shows what makes Spidey unique, as he battles impossible odds using his scientific smarts and sense of humor. Wanna read it? Click here! How could it be a game? This event had everything a Spider-Man game needs. There's an open-world version of Manhattan in crisis. Spider Island has numerous unique villains for boss fights, plus thousands of superpowered thugs to use as common enemies. There are numerous cameos by Marvel characters as famous as Captain America and Wolverine. And the story even ends with the main villain transforming into a hundred foot monster! I can't imagine a more video-gamey finale. The plot: Not every story needs to have dramatic revelations; sometimes it's just fun to watch a guy with spider powers destroy a bunch of robots. That was the plot of 1992's Invasion of the Spider-Slayers, a six-part story that saw the Wall-crawler fight dozens of anti-Spider-Man androids, including a few that seemed destined to be toys. This exciting, if inconsequential adventure has Spidey battling increasingly tough Spider-Slayer bots until he faces their fairly cool looking master. And all the badass robot-busting action is supported by art from veteran Spidey artist Mark Bagley. Wanna read it? Click here! How could it be a game? Technically this storyline already has a game, but today's devs can do better than that horrendous Game Boy title. The PS4 and Xbox One could each do justice to those sprawling robot battles, plus we'd get a next-gen look at famous rogues like Electro, Scorpion, and Black Cat. The Spider-Slayer concept would also be a good way to deal with the fact that Spidey battles countless robots in basically every game he stars in. I understand that A.I. make for easy, T-rated enemies, so Spider-Slayers would at least be a more plausible reason for all that metal mayhem on-screen. The plot: When he made his first full appearance in Amazing Spider-Man #299, Venom was a terrifying villain, at least to the 10-year-old reading him. This huge creep that had all of Spider-Man's powers and knew all his secrets, and was ready to eat Peter's brains as a form of twisted revenge that would take far too long to explain. Venom (real name Eddie Brock) and Spider-Man had some of the most brutal, personal, entertaining battles in Spidey's history, all of which ended when Venom became a more commercial anti-hero in the mid-90s. Venom becoming relatively good didn't ruin the character, but many fans miss him being Spider-Mans deadliest foe. Wanna read it? Click here! How could it be a game? It would play out much like the comics, with Spider-Man going on adventures and battling lesser bad guys, only to be blindsided by Venom at the most inopportune moments. Much like Nemesis in Resident Evil 3, Venom would be this unstoppable force that Spidey would need to avoid at all costs, culminating in a fight to the death on a tropical island, as seen in Amazing Spider-Man #347. It'd be Far Cry 3, only you don't need drugs for something as freaky as a spider-powered alien symbiote. The plot: The Ultimate Spider-Man comics repackaged Spidey for the New Millenium and could've easily fallen if not for the talented creative team of Brian Michael Bendis and Mark Bagley. They made the adventures of this younger Webhead work splendidly, crafting over 100 issues together telling more grounded, human Spidey stories - that is, until the two killed off Ultimate Spider-Man before he even left high school. The kid went down swinging in an impressive brawl against his most dangerous foes, eventually saving the day at the cost of his own life. Wanna read it? Click here! How could it be a game? Gamers don't just love Batman's Arkham games for capturing the essence of Bats, but also for its grim and gritty tone. The Death of Ultimate Spider-Man would have that too, with Spidey swinging around a more realistic New York, dealing with a nagging gunshot wound, and battling even more homicidal versions of Green Goblin and Sandman. If people were shocked by the morbid tone of the Arkham games, just imagine watching a young Peter Parker bleed to death on the street. The plot: Most great Spider-Man stories show Peter Parker fighting against incredible odds or feeling guilty over the loss of a loved one. Then there are the offbeat Spider-Man comics like this single issue story from #267 that showcases the hero's aptitude for humor. Spidey chases a crook from Manhattan all the way to suburban Scarsdale, NY, where Parker is harassed by dogs, children, and the neighborhood watch. 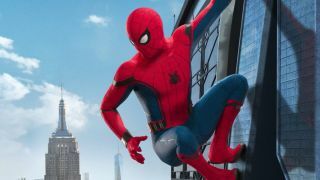 Without tall buildings, Spidey is forced to find other transportation, leading to a new low for the character when he's thrown off the bus for not paying the fare. Spider-Man's heroic duty is rarely as funny as it is in this low-key adventure. Wanna read it? Click here! How could it be a game? Like the comics, not every Spider-Man video game needs to be a massive event either. There's room for a $10 Steam title as well. The Commuter Cometh - likely with a more marketable title - could be a brief downloadable adventure in the style of The Walking Dead (only funny). The storytelling depends on Spider-Man engaging in goofy conversations instead of fistfights, hopefully showcasing Spider-Man's snappy dialogue better than any game the character has ever appeared in before. The plot: Published in 1976, the first true Marvel/DC crossover in history cut to the chase by having Spider-Man face Superman in a comic book prizefight for the ages. Well, at least that's what the cover promised, but after Clark Kent and Spider-Man briefly tussled - with Supes taking it easy on the much lower powered Spider-Man - the two became the best of buddies, which was still a big treat. They teamed up to stop the cross-company villain duo of Lex Luthor and Doctor Octopus, saving the world together even if Superman could likely have handled it alone. The two have teamed up since, but none of them topped the 70's-tastic original written by Gerry Conway, with art by Ross Andru. Wanna read it? Click here! How could it be a game? Gaming has so many bizarre crossovers that a Superman vs. Spider-Man action title would fit in well. It could be a co-op game, or one where you swap between the two characters as each uses their abilities to complete objectives. Admittedly it'd be tough to get both to control well, particularly given that there's never been a good, solo Superman game. Clark has battled Mortal Kombat's Scorpion, while Spidey has faced Mega Man, so let's just cut to the chase and have the one gaming crossover that all comic fans can enjoy. It can't be any worse than the last comic crossover game, Iron Man and X-O Manowar. The plot: This story is surprisingly forgotten despite selling a record 2.65 million back in 1990, but that's probably because the lackluster plot cant keep up with flashy art. Spider-Man fighting a voodoo-controlled reptile hybrid is undeniably silly, but this bloody fight is one of the most intense and graphic Parker has ever had. The massive brawls and the intricate details of Spidey's tattered costume let superstar artist Todd McFarlane show off the skills that would later make him a multimillionaire with his next creation, Spawn. Wanna read it? Click here! How could it be a game? Previous Spider-Man games have kept the arachnids arsenal of attacks fairly PG, sticking to punches, kicks, and the occasional shot of webbing. Torments has a Spidey that bleeds, is driven to the verge of insanity, and isn't worried about smashing The Lizard in the face with some heavy chains. Spidey's in-game combat could reach new levels of intensity in Torment, perhaps giving Parker a dose of God of War-style combat (maybe without any heads getting ripped off). Of course, the five issues of grisly murder would need some filler to make it work for a full campaign, but that's why C-list villains like Shocker and Mandril exist. The plot: Spider-Man has been battling the Sinister Six for almost 50 years, but this multipart story saw the team of villains pose the biggest threat yet. Doc Ock leads Electro, Rhino, Chameleon, Mysterio, and Sandman in a plan to hold the world hostage with the threat of setting fire to the planet's atmosphere with remote satellites. Spider-Man teams up with the Avengers to stop them. The end result is some crazy fight scenes and a handful of heroic sacrifices that still bring a tear to my eye. Wanna read it? Click here! The plot: Doctor Octopus had long been one of Spider-Man's greatest foes, but he reached de facto arch enemy status with this nefarious body-swapping story. Doc Ock was near death when he successfully put his mind into Peter Parker's body, becoming a Spider-Man that still fought crime, but in a very different way. Watching Doc Ock grow and change as he lived out Spider-Man's life for over a year's worth of comics saw him cross lines the real Peter never would, getting more calculating and violent. It gave the series an unpredictability that kept readers on edge for over 30 issues until Peter finally reclaimed his mind and body (coincidentally just in time for The Amazing Spider-Man 2 to hit theaters). Wanna read it? Click here! How could it be a game? As someone that's played basically every Spider-Man game in the last 20 years, I know that not every in-game interpretation of the Wallcrawler feels all that special. That wouldn't be the case in a Superior Spider-Man game, where all of Doc Ock's upgrades to Peter's crime-fighting arsenals could be smartly implemented as level-up unlocks. The dark tale that sees appearances from Venom and Green Goblin could make for a whole trilogy of games, but I'll settle for just one.